These leopard brooches are adorable yet fierce. Stunning with their sparkly crystals yet subtle enough in color to not stand out too much and be tacky. 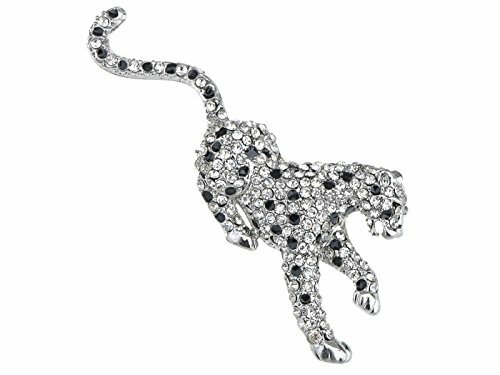 For the wild cat lover, these brooches are an easy way to spice up a look with a simple clasp. Whether as a piece for your own personal jewelry accessory collection or as a gift to a loved one, these cats are purrfect. ADORABLE CAT STYLES. Show off your love for the fiercer felines in nature! Choose from four different snow leopard cat brooch styles. From their beady crystal eyes to their sparkly crystal bodies shaped in fun poses, these brooches are sure to be a hit with cat and animal lovers even if they normally don't wear jewelry often. DECORATE A COLLAR, A BAG, AND SO MUCH MORE. There's just so many ways you can utilize a brooch. You can use add them to a blouse collar, a fancy neckline, decorate a dress waist... you're only limited by your creativity. If you have an old bag or hat you want to repurpose, adding a brooch is an easy way to give it a new fresh look. PERFECT FOR MANY OCCASIONS. They have that vintage vibe making them fun statement pieces for an exotic themed wedding, prom, and parties where you just want something unique. They also make a great gift for occasions such as Mother's day, Valentine's Day, graduations... or even use them as a way to enhance your Halloween outfits. ALILANG is a registered trademark located in beautiful California. This item is ONLY fulfilled by Amazon and seller "Anna-Kaci"